Children love stories! Undoubtedly, children love hearing stories in whatever form – in print, read to them, read on their own, on television, in movies, etcetera. It may sound surprising to some, but majority of children prefer listening to stories read to them by their moms. They may not always enthusiastically show it but they do love it when their parents read them stories before they sleep at night. Try to recall your own childhood. I’m pretty sure you treasure those bedtime stories your mom used to read to you. I believe that all mothers are natural storytellers. Some just need a little prodding to help bring out this gift. This weekend may just be the right time to unleash the Mother Goose in you. 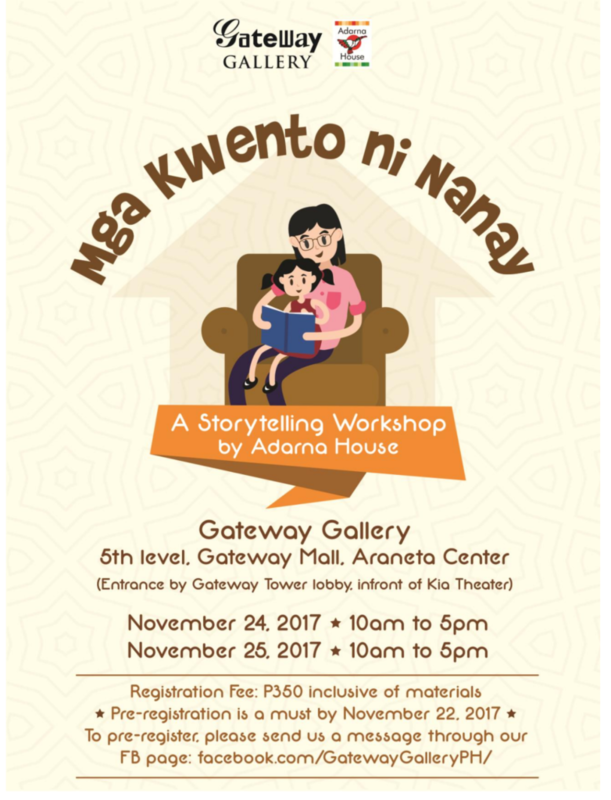 On November 24 and 25, the Gateway Gallery in partnership with Adarna House is holding the 2nd Mga Kwento ni Nanay: A Storytelling Workshop. This workshop is designed to strengthen the reading campaign of the Gateway Gallery by involving parents, guardian, teachers and volunteers in the community. If you want to learn helpful techniques to become an effective storyteller, this workshop is perfect for you. This activity not only emphasizes the benefits of reading but espouses spending quality time with our children for their overall development. We’ve often been told that the best gift we can give to our loved ones is time. Well, what better way to spend that time than sharing stories with our children. Mga Kwento ni Nanay: A Storytelling Workshop is just one among many programs of the Gateway Gallery that promotes the benefits of reading and the importance of literacy in our society. Read on to learn more about this advocacy. The Gateway Gallery, managed by the J. Amado Araneta Foundation (JAAF) – the Corporate Social Responsibility arm of the Araneta Group, strongly believes in the importance of reading and literacy. In June 12 this year, the Gallery unveiled its “Liwanag Reading Corner”, a 7-piece mobile wooden sculpture inspired by the story of the Lamp and the Moth told by Teodora Alonzo to the young boy Jose Rizal. This one-of-a-kind art piece aims to promote our Filipino heritage and encourage reading by showcasing select books on Philippine history, culture and arts for all ages. Reading has insurmountable benefits that cannot be neglected. It fosters individual growth that can spur national development. Encouragingly, the Philippines does not lag behind on basic literacy. In 2013, 96.5 percent of 74 million Filipinos 10 years old and over were basically literate. Basic or simple literacy – is the ability of a person to read and write with understanding a simple message in any language or dialect. Furthermore, nine out of every ten Filipinos 10 to 64 years were functionally literate. Functional literacy includes not only reading and writing but also numeracy skills. The skills must be sufficiently advanced to enable the individual to participate fully and efficiently in activities commonly occurring in his life situation that require a reasonable capability of communicating by written language. A functional literate person is one who can at least read, write, compute and/or comprehend. Also, persons who graduated from high school or completed higher level of education are classified as functionally literate. Though the statistics looks good, the number significantly drops when comprehension or higher level of literacy is considered. Only 5 out of 10 elementary graduates can read, write, compute and comprehend. While this number improves as the students reach high school, only about 60% of the population actually reaches high school thus, attaining this level of literacy. Employment/ looking for work (28.8%), Family income not sufficient to send child to school (15.7), and lack of personal interest (14.9) are top 3 reasons for not attending school/ dropping out. The Gateway Gallery Reading Program aims to foster literacy or love for reading and books among Filipino children. It supplements the current DepEd programs on improving the literacy rate in the country with emphasis on promotion of Filipino history, arts, and culture. Unveiled during the Philippine Independence Day on June 12, 2017, the “Liwanag Reading Corner” is a 7-piece mobile wooden sculpture inspired by the story of the Lamp and the Moth told by Teodora Alonzo to the young boy Jose Rizal. The one of a kind art piece aims to promote our Filipino heritage and encourage reading by showcasing select books on Philippine history, culture and arts for all ages in the gallery. Kuwentuhang Adarna sa Gateway Gallery is a monthly storytelling session for community children. The activity aims to promote book enjoyment through animated storytelling and activities. The stories are told by storytellers from Adarna House using Adarna books. The session ends with distribution of snacks and educational gifts. The Liwanag Reading Caravan is a storytelling – school campaign where celebrity storytellers visit nearby schools to promote the value and habit of reading. It also encourages the students to visit Gateway Gallery’s Liwanag Reading Corner for some “after-school reading”. Mga Kwento ni Nanay is a one-day storytelling workshop designed to strengthen the reading campaign of the Gallery by enlisting parents, guardian, teachers and volunteers in the community. Participants are briefed on the value of reading and helpful techniques to become effective storytellers. The activity not only emphasizes the benefits of reading but espouses spending quality time with the children for their overall development. In the last 5 months since they launched their reading program, they were able to reach 230 children, trained nearly 100 storytellers and distributed more than 150 books. This November 24 & 25, as celebrate the National Reading Month, the Gateway Gallery is holding its 2nd Mga Kwento ni Nanay : A Storytelling Workshop in partnership with Adarna House. The workshop is designed to strengthen the reading campaign of the Gallery by involving parents, guardian, teachers and volunteers in the community. Participants are briefed on the value of reading and helpful techniques to become effective storytellers. The activity not only emphasizes the benefits of reading but espouses spending quality time with children for their overall development.